Looking at the people I’ve followed throughout my lifetime, I’ve discovered this to be true. Leaders are readers. They know they need to be consuming the thoughts of others so they can expand their influence. With this in mind, I’ve cultivated a habit of reading over the years. I try to read as much as possible so I can comprehend what other leaders are thinking. Reading is one of the easiest ways to get into the minds of the greats. They’ve recorded their thoughts for all of us to read. Who wouldn’t want to pick up a book and glean the insights from those who have gone before us? That’s why reading is so vital to a leader. In 2014, I read a lot. Tallying up the books, the total came to 34 books read. Today, I want to share with you the books that impacted my life and a leadership lesson I took away from each book. Are you ready? Let’s start off with the physical books I read in 2014. I find that physical books are my favorite type of book to read. It allows me to hold the pages in my hands and easily underline and take notes as I read. 1. YouTility: Why Smart Marketing Is About Help Not Hype by Jay Baer – Bear wrote an amazing book on why helping is the new marketing. One of the stories that stood out the most to me was the story about Taxi Mike in Banff, Alberta Canada. Taxi Mike knows how to be helpful. He created Taxi Mike’s Guide To Banff! and distributes these to local businesses for customers to take. With the guides, Taxi Mike isn’t trying to sell anything. Rather, he’s providing help to those in the city. In return, the people who pick up Taxi Mike’s Guide To Banff! tend to call him when they need a ride. It’s not about selling, it’s about helping. 2. The Elephant To Hollywood by Michael Caine – Caine is a well-known name in Hollywood. From his roles in Zulu, Deathrap, and Harry Brown, Caine has had a career of over five decades as an actor. His book, The Elephant To Hollywood, is the story of his life in Hollywood. This wasn’t my favorite book of the year but it was fun learning about Caine’s life. He’s experienced many successes and many more failures. That’s my big takeaway. Even if you fail, you can pick yourself back up and keep going. 3. Calming The Storm Within: How To Find Peace In This Chaotic World by Jim Lange – Jim and I became friends through our blogs and LinkedIn. It was through his kindness that I received his book. I’m glad I was able to read this book this year. With how chaotic life has been, Jim’s book helped reassure me that life isn’t easy but we are able to make it through with faith and hope. In Calming The Storm, Jim mentions how we all need accountability and that’s why we typically lack self-control: We have no one to answer to. That’s a great reminder to find someone to confide in. It’ll keep us in check and help us find our way forward. 4. Untitled: Thoughts On The Creative Process by Blaine Hogan – Last year I wanted to focus more on creativity and making things. There were a few books that helped me in this. Untitled was one of those. Standing in the face of fear, regardless of what has happened in the past, means that fear can’t have the last word. We need to get over fear and live the lives we were called to. We can’t do this if we’re always letting fear have the last word. 5. The Day Metallica Came To Church: Searching For The Everywhere God In Everything by John Van Sloten – This book has sat on my bookshelf for a few years now. I don’t know why I waited so long to read it but I did. However, this year I made sure it was on my reading list. I’m glad it was. Van Sloten shares how we can find God everywhere. From the beauty of the outdoors to the creative endeavors of even secular artists. God is there. 6. Mojo: How To Get It, How To Keep It, How To Get It Back If You Lose It by Marshall Goldsmith – I picked up Mojo because I know it’s important to feel happy and find meaning in what you’re doing. Since my life ebbs and flows in this arena, I thought Goldsmith’s book would help. The biggest leadership principle I took away from Mojo was that we can’t look at our own view of logic to win the day. This means we shift from feeling objective to making a positive difference. 7. Wild At Heart: Discovering The Secret Of A Man’s Soul by John Eldredge – This is the second or third time I’ve read through Wild At Heart and I’ve found it just as applicable today as I did the first time I read the book. What we can take away from Wild At Heart is that men and women are created differently. We can’t lead men and women in the same way. It doesn’t work. 8. Stuck: Why We Can’t (Or Won’t) Move On by Annelia Rufus – Pam got me this book as a present for Christmas last year. She liked the cover and thought I would as well. She was right, cover rocks with a turtle on his back. The book had some great leadership and life principles but left me a bit wanting. That doesn’t mean it’s not a good book, just not a good fit for me. It seems for every situation we encounter, we want to have an excuse at hand. We don’t want to hold the blame. We want to place the blame elsewhere. One of the keys to moving on is learning to get rid of our excuses. 9. Moment Maker: You Can Live Your Life Or It Will Live You by Carlos Whitaker – I became a fan of Carlos’ because of his work with the Catalyst Conference. He’s been a staple at these events for as long as I’ve attended. Here’s what I thought of Moment Maker. 10. Leaders Eat Last: Why Some Teams Pull Together And Others Don’t by Simon Sinek – Another Christmas present from a friend last year. I was really excited to get this book and for good reason. Sinek encourages leaders to put themselves last when it comes to leading a team. We can’t look out for ourselves and effectively look out for others. I also wrote a blog post on Leaders Eat Last. 11. Cavetime: God’s Plan For Man’s Escape From Life’s Assaults by Jeff Voth – Another area I wanted to improve upon in 2014 was my spiritual life. I know how important faith should be to leaders and sometimes I’ve neglected it. Cavetime shares King David’s story as he hides in the caves while running from Saul. It was an interesting perspective and I enjoyed reading it. The key leadership takeaway I got from Cavetime was that we have to pick what fights we are willing to fight. Picking the right ones will move us forward, picking the wrong fights will set us back. 12. Thrive: The Third Metric To Redefining Success And Creating A Life Of Well-Being, Wisdom, And Wonder by Arianna Huffington – Huffington is an interesting person. She’s the co-founder and editor and chief for the Huffington Post Media Group. She also realized she was taking on too much in her day-to-day life. That’s where Thrive comes in. Here’s my thoughts on Thrive. 13. Impact: Great Leadership Changes Everything by Tim Irwin – With a resounding endorsement from Seth Godin, it cemented my decision to pick this book up. Impact had me turning the pages and feeling engaged throughout the whole book. Looking through my notes, I see many dog-eared pages. Seems like almost every other page had some golden leadership nugget. We are always one errant. unthinking action or careless word away from getting outside the boundaries of good judgement or even the moral absolutes that must frame all decisions. How truthful is that quote from Impact? And how much more should we be aware of this truth? Keep in mind, you’re one misstep away from throwing it all away. 14. Jab, Jab, Jab, Right Hook: How To Tell Your Story In A Noisy Social World by Gary Vaynerchuk – Writing a blog, I feel I need to be up to date on the latest social media trends and that’s the reason behind picking up Jab, Jab, Jab, Right Hook. It’s a playbook on how to make the right choices in social media and land a knockout punch. From it’s awkward shape to the glossy, beautiful pages inside, the book stands apart from others in the field. You can tell a lot of thought went into creating a beautiful package. And it’s filled with great content as well. Biggest takeaway? Know your brand and know your followers. Market in that direction. 15. The Secret: What Great Leaders Know And Do by Ken Blanchard and Mark Miller – The Secret hit it’s 10th anniversary with over half a million copies sold. And it’s still going strong. Blanchard and Miller have a unique way to deliver leadership lessons. They do it in a parable/fiction setting that engages more than a textbook format. You will learn that helping people leverage their greatest strengths will help move you and your organization forward more than anything else. 16. A Curious Man: The Strange And Brilliant Life Of Robert “Believe It Or Not” Ripley by Neal Thompson – Ripley’s a fascinating man. From humble beginnings to a life of luxury, Ripley lives quite a life. Here’s the leadership lessons from the life of Robert Ripley. 17. Created For More: 30 Days To Seeing Your World In A New Way by Jonathan Malm – This was another book that helped me get into the Word and see that faith was important. Whether you’re a leader or creative or a regular person, we were created for more. Check out my interview with Jonathan Malm.Definitely a book you should pick up if you’re looking for a good devotional. 18. The Unbeatable Recipe For Networking Events by Robby Slaughter – Everyone’s looking for a better way to network at local events. Robby provided quite a few insights into networking better. My favorite was the idea of using note cards to store and organize the business cards you receive at networking events. You can stick the business card to the front and make notes on the back of the card. 2014 was the year I really got into audio books. Thanks to a subscription to Audible.com, I was able to build up quite the audio book collection. Not only that, listening to audio books helped me transform my drive into the office into an automobile university. If you haven’t subscribed to Audible yet, I highly encourage you to. When you subscribe using my link, you can receive a free audio book of your choice. What are you waiting for? 19. A Captain’s Duty: Somali Pirates, Navy SEALs, and Dangerous Days at Sea by Richard Phillips – Most people have heard of the harrowing tale of Captain Phillips and his crew aboard Maersk Alabama. One fateful day, a band of Somali pirates boarded the ship and took the crew hostage. We can learn that regardless of the situation, we need to keep a cool head. We can’t freak out when things don’t go our way. Rather, think through the situation and work towards a resolution. 20. The Great Escape by Paul Brickhill – More than 600 British and American POWs devised and carried out an extensive escape plan. Through many trials and setbacks, there was victory. The soldiers fighting to free themselves from the German POW camp had to use ingenuity and resiliency to continue carrying out their escape. Time after time, the German’s discovered the plot and set them back weeks and months. Leaders will face the setbacks as well. We can’t let those setbacks derail the plans. Rather, work through the setbacks, redefine the plan, and get to work. 21. The Five Elements of Effective Thinking by Edward B. Burger and Michael Starbird – This short and powerful book will help you change the way you think. You’ll come out of the experience with a way to think more effectively. If that’s your goal, pick this short audio book up. It’s only 3 hours and 9 minutes but it packs a big punch. The stories they use throughout the book really make the practices come alive and memorable. 22. Take the Risk: Learning to Identify, Choose, and Live with Acceptable Risk by Dr. Ben Carson – I’ve heard so much about Ben Carson that it’s ridiculous. But he’s truly a brilliant man and deserves the attention he’s received. Carson lays out a specific method he uses to take risks. This method alone is worth the price of the book. Go to my blog post to find out this method for deciding whether or not to take a risk. 23. FREE: The Future of a Radical Price by Chris Anderson – Quick side note, I had a best friend growing up who was named Chris Anderson. I didn’t realize that was the author’s name until doing this recap. Chris has an interesting idea. His belief is that the model of charging for everything is going out the window. We’ve clearly seen this with the proliferation of blog posts, giveaways, and podcasts. Free seems to be the new IN thing and it works to an extent. The growing influence of the internet and the decreasing price to do so has made giving out information and digital products cost almost nothing. The question I’m left with is: What are we going to do with this? 24. The Reason I Jump: The Inner Voice of a Thirteen-Year-Old Boy with Autism by Naoki Higashida – This was an interesting book, to say the least. Written by a 13-year old boy with autism, you get to see into the mind of an autistic. The book was very well written and read. You could see the struggle and pain Naoki has felt in dealing with his autism. Yet you also see the joys that he gets to experience. We can learn that even though people have a disability doesn’t they have to be treated with any less respect. 25. Masters of Doom: How Two Guys Created an Empire and Transformed Pop Culture by David Kushner – Growing up in the glory days of video games, I had to pick up this audio book. Especially since it was narrated by Wil Wheaton of Star Trek fame. Masters of Doom delves into the company and relationships behind the creation of the video game Doom. You see a pack of hungry, young men looking to make a name for themselves and what happens when it becomes about YOU rather than the mission. 26. Making Habits, Breaking Habits: Why We Do Things, Why We Don’t, and How to Make Any Change Stick by Jeremy Dean – We all think that we’re in control of our actions. We think we’re mentally aware of all that’s going on. Making Habits, Breaking Habits shows us just how wrong we are in this line of thinking. Most of our day to day actions come from our habits, not conscious thought. We’ve programmed ourselves to carry out rout tasks without us ever thinking of what we’re doing. 27. Detroit: An American Autopsy by Charlie LeDuff – Being a Michigander, Detroit sounded like an interesting read. And it was. LeDuff brings to life the scenes he had witnessed in the heart of Detroit. From a mugging to the coverage of a murder, LeDuff covered a great deal of his personal history along with that of Detroit. One story that sticks out to me is the condition of the Detroit Fire Department. With so many cutbacks, the fire department had a difficult time doing their jobs. Fires would rage out of control and they couldn’t do a thing about it. This story left me with this question: How many times can we cut back on our teams until they can no longer effectively do their jobs? 28. Super Mario: How Nintendo Conquered America by Jeff Ryan – Another video game themed book. As a child, Nintendo was the video game console to own. You had the best games: Mario Brothers, Duck Hunt, and others made people rush to buy the consoles. However, that’s not the leadership lesson I took away from Super Mario. Rather, it’s that a company can transition. Nintendo, if you didn’t know, started out as a card game manufacturer. They then transitioned into the video game arena where they saw great success. 29. Fitness Confidential by Vinnie Tortorich – Originally, I heard about this book from Pat Flynn’s Smart Passive Income Podcast. He’d done an interview with Vinnie and his personality made me want to read this book. Vinnie is a unique character. He can come across as very abrasive and rude yet he knows what he’s talking about. He shares some of the tricks he uses to help famous people lose weight. They’re interesting and counter-culture most of the time. Leadership takeaway? Sometimes we have to go against the grain to get results. 30. The War of Art: Winning the Inner Creative Battle by Steven Pressfield – After hearing so many of my mentors rant and rave about The War Of Art, I felt I needed to get a copy of it. Sad to say, this was probably my most disappointing book of the year. Pressfield didn’t hold my attention and didn’t tell me anything I didn’t know. My recommendation would be to pass on this book. That’s not to say there’s not nuggets in the book. The biggest one takeaway is that we have to push through even when we feel resistance. Most often that resistance is trying to hold you back rather than protect you. Last but not least, I did read on my Kindle Fire this year. Reading on the Kindle probably ties with using audio books to read. It takes me longer to read on my Kindle than it does with an audio book but eBooks allow me to more easily take notes and keep track of what I’ve read. It also gives me something to hold in my hands unlike an audio book. 31. Born To Win: Find Your Success Code by Zig Ziglar – This was Ziglar’s final book and a fine way to leave the world. Ziglar shares the combined wisdom of his decades worth of teachings all in one book. You can tell Ziglar loved to teach and wanted to help each and everyone of us become a better person. Once we begin to make certain types of choices, the likelihood of making similar choices in the future almost becomes a self-fulfilling destiny. Our decision to go in one direction tends to increase the likelihood of us continuing in that direction. Make sure you’re making decisions that lead you where you want to go. 32. From Your Head to Your Hands: How to Write, Self-Publish, and Launch Your Book by Derek C. Olsen – Research shows that most of us have a book or two we would like to write someday. And yet so many people fail to ever write a book. They keep it inside and it goes to the grave with them. That’s why Derek wrote From Your Head To Your Hands. It’s a guide on how to self-publish and create a book. If you’re looking for a good method for publishing your book, this is the book for you. Study book reviews and look for what readers are saying they like and what they are saying remains to be desired. To me, this is an amazing insight people fail to take action on. They’ll write a book thinking they are writing it for the masses. The problem is, there might not be anyone looking for it. That’s why you need to search out who your customers are, find out what they’re buying/reading, and see what’s missing. You can hop into an arena that’s looking for the answers and people are trying to tell you what they want! 33. The Freaks Shall Inherit the Earth: Entrepreneurship for Weirdos, Misfits, and World Dominators by Chris Brogan – My friend, Tania Dakka, gifted this Kindle book to me. So, thanks a ton Tania! I really enjoyed reading it. Brogan is a master when it comes to building an audience and taking action. His previous work, Trust Agents, laid the foundation for this book. The Freaks Shall Inherit The Earth is all about how being a little out there can help you capture an audience and find success. “Fitting in” often means shaving off your unique edges, hiding and masking what defines you, discarding any behaviors or appearances or images that prompt others to question you or push away from you. “Belonging” is about finding that place where you finally let out a deep breath you had no idea you were holding and feeling with great certainty that the people around you understand you. Brogan shared the above quote. I think it applies to leadership well. We don’t have to stop being unique to be successful. Rather, by having differences we draw those like us in and we form a tribe around them. Don’t stop being unique. You were created that way for a reason. 34. Redefine Rich: A New Perspective on the Good Life by Matt Ham – Matt’s another close friend of mine from the blogging world. He recently released his new book Redefine Rich. The stories Matt shares are special. You can feel the pain and the joy that one would feel if they were having the experience themselves. I loved this book because Matt shows us that being rich isn’t about the material goods we have. Rather, it’s the experiences we have and the love we show to others that define how rich we truly are. I think as you’ve read my blog this year and in the coming year, you’ll see how these books shaped my life and my writing. 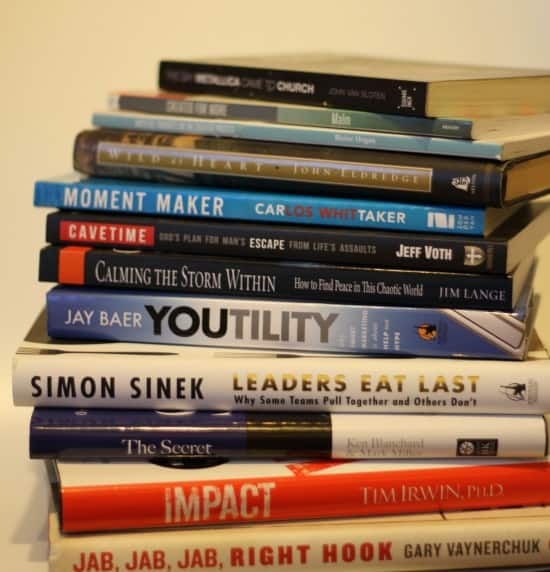 Whether it’s in finding new ways to market my blog to taking in new leadership ideas, these books contained a wealth of information that’s invaluable to me. Question: What book did you read in 2014 that had the biggest impact on your life? Please share it in the comment section below.